— With a flash of flame and a puff of smoke, SpaceX's first '21st century spacecraft' soared skyward on Wednesday (May 6) in a test that left the rocket behind. 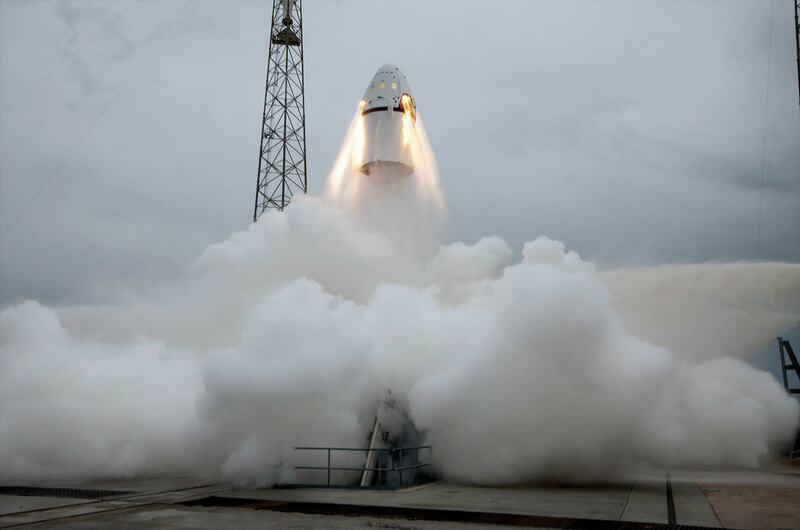 The commercial spaceflight company's first Crew Dragon, a capsule designed to fly astronauts to and from low Earth orbit, leapt off its launch pad, but not because of a booster propelling it from below. 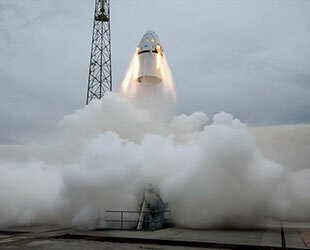 Instead, the Dragon fired its own on board thrusters in a demonstration of its launch escape system. "I'm just very proud of the SpaceX team for achieving this right off the bat," Elon Musk, SpaceX CEO, told reporters after the flight. "It was quite a complicated test." Known as a "pad abort test," the Dragon's flight was a trial run for the system developed to quickly get the spacecraft and its crew away from its rocket in the event of an inflight failure. "It's similar to an ejection seat for a fighter pilot," SpaceX officials stated, "but instead of ejecting the pilot out of the spacecraft, the entire spacecraft is 'ejected' away from the launch vehicle." 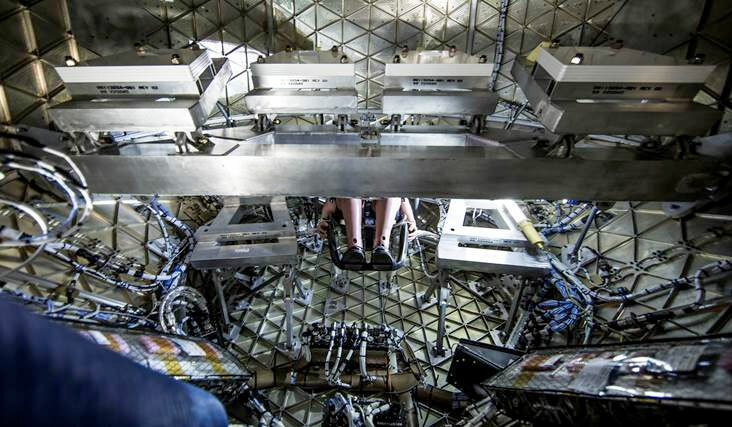 No astronauts were on board the Dragon for Wednesday's test, though an instrumented dummy was strapped into a seat to collect data on the gravitational forces experienced inside the craft. SpaceX, along with Boeing, has a NASA contract to fly astronauts to the space station beginning in 2017. "Had there been people onboard, they would have been in great shape," Musk said. The Crew Dragon's entire flight, from liftoff to splashdown, lasted about one minute and 39 seconds. The 20-foot-tall (6 meter) spacecraft "aborted" at 9 a.m. EDT (1300 GMT) from Complex 40 at the Cape Canaveral Air Force Station in Florida. "Dragon went from 0 to 100 miles per hour in 1.2 seconds. So that's pretty zippy," Musk remarked. "The top speed reached by the Dragon was 345 miles per hour," he added. The craft's eight SuperDraco engines, burning a mixture of hydrazine and nitrogen tetroxide, fired together to produce slightly under the nominal 120,000 pounds of thrust. "One of the eight engines was slightly off mixture ratio but not in a way that materially affected the flight," Musk said. "We're talking very slight." 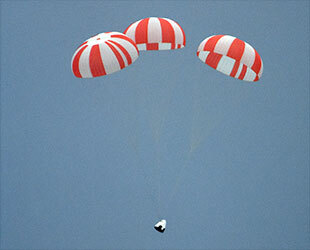 The capsule was more than a third of a mile (0.5 km) high at five seconds when the abort burn was terminated. The Dragon then coasted to a peak altitude of 3,894 feet (1187 m), about 985 feet (300 m) short of the flight's target. At about 20 seconds, the Dragon jettisoned its trunk and rotated so that its heat shield was again directed towards the ground. 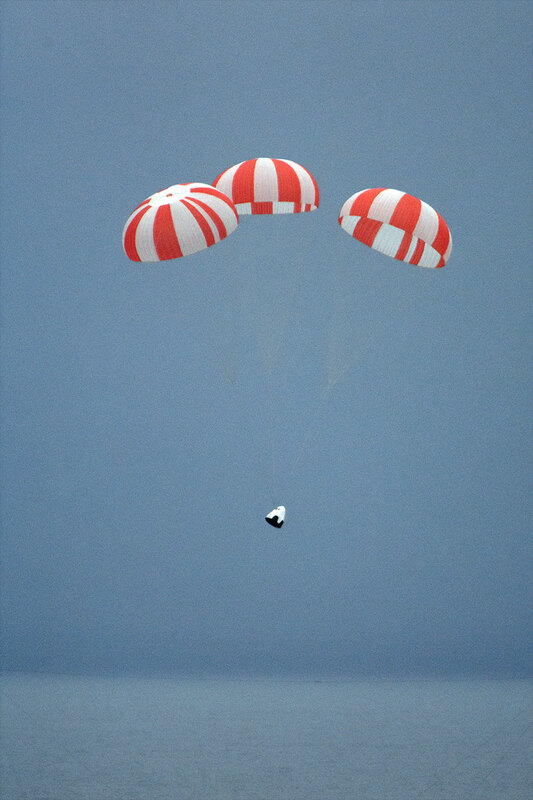 About four seconds later, two drogue chutes began deploying to stabilize the vehicle, before three main parachutes slowed the Dragon's descent. Just under 100 seconds after leaving the pad, the Dragon returned to Earth, splashing down 0.7 miles (1,200 meters) downrange in the Atlantic Ocean. SpaceX staged boats to recover the craft for analysis. Historically, launch escape systems have relied on rocket motors attached to a tower mounted above the spacecraft. In the case of an emergency (or during an abort test), the tower's thrusters would fire, pulling the capsule away from the booster. "This works well while the spacecraft is on the launch pad and for a few minutes into ascent, but once the vehicle reaches a certain altitude, the system is no longer useful and must be discarded," SpaceX stated on its website. 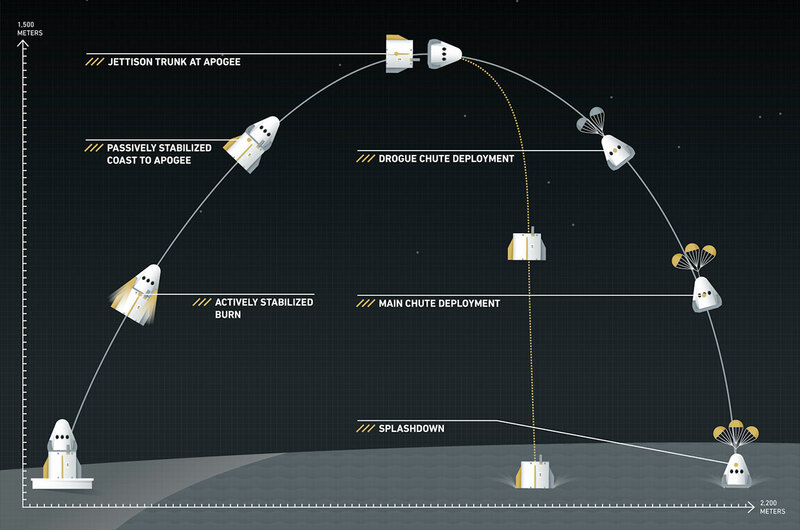 SpaceX's system addresses both concerns by integrating it into the Dragon itself. "You don't have to throw it away every time [so] you make it to some extent safer," Hans Koenigsmann, SpaceX's vice president for mission assurance, told reporters during a pre-test briefing. "It is integrated into the system, so you have redundancy in the system that you also use for other parts." "I think, overall, it is the more integrated approach, it's the more sophisticated, modern approach, and in my opinion it is also the safer approach to launch escape," he said. 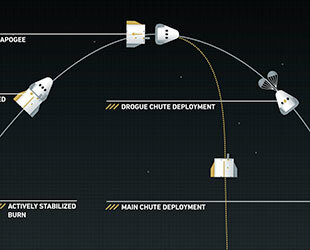 If an abort is not needed, SpaceX may be able to use the SuperDraco engines and their fuel supply to propulsively land the Dragon, rather than deploy parachutes. A test to advance this approach is planned for later this year, as is another abort system demonstration. For the next test, rather than departing from a pedestal on the ground, the same capsule that flew on Wednesday's pad abort will separate mid-flight from a SpaceX Falcon 9 rocket. 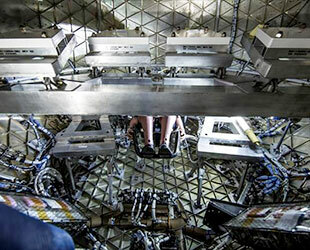 This in-flight abort, which adds the stresses of an ascent, could launch from Vandenberg Air Force Base in California as early as this summer. "I think this [pad abort] bodes quite well for the future of the program," Musk said. "I don't want to jinx it, but this is really quite a good indication for the future of Dragon."